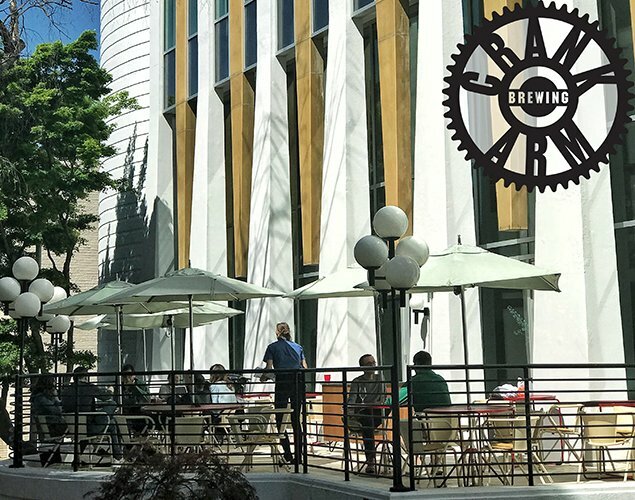 Raleigh’s Crank Arm Brewing takes over the patio with beers on tap at an outdoor bar and a menu of beer-friendly snacks like hot pretzels from the kitchen. Stop by for a Rickshaw Rye IPA, Whitewall Wheat, or the newly released Pace Line. Rickshaw Rye IPA – American Style IPA gets a 24% dose of rye malt to add complexity and a slight spiciness. American variety Columbus and Nugget hops give a unique flavor and aroma. Take a ride today! Whitewall Wheat – A new take on a Belgian classic. Traditional wheat malt and Belgian yeast with citrus aroma and flavor not from spices; but instead from Citra hops. Light and crisp, this one will have you wanting more. Bronze medalist at the Great American Beer Festival in the American Belgo Category. Pace Line – Extra hoppy session IPA packed with Citra, Mosaic, and Cascade hops. Built to help you hold the Pace Line all while getting your fill of hops!